Sonko slaps Shebesh, weeks after the "Gubernatorial Slap"
When Nairobi Governor Dr Evans Kidero lost his cool and slapped TNA women representative Rachel Shebesh in a confrontation which left the city awed, wild and, in some quarters, charmed; another revelation is now emerging that Hon Shebesh was engaged in yet another scuffle on Thursday by Hon Mike Sonko, the Senator for Nairobi County. The incident is said to have taken place at Crowne Plaza Hotel in Nairobi on thursday at around 11pm. It is not known what business the two had been undertaking when, tipsy and carefree, the two begun a shouting match which ended with, according to eyewitnesses, the flamboyant senator whacking shebesh severally in almost all parts of her body, save for the places that could swell profusely. Interestingly, and unlike Kidero’s ordeal, Â Shebesh rushed to a gender violence based body to report Sonko who have since dismissed the organization and threatened to take legal action against Shebesh. Like Kidero, Sonko claims Shebesh assaulted him, a charge the employees of Crowne Plaza substantiated by their claims that they heard Shebesh spew unprintable invectives towards the Senator. “I have been told that she (Shebesh) has reported the matter to Kilimani Police Station, but time will tell the truth. Men are being battered in silence but the so called Covaw which is composed of divorcees has the tenacity to attack men wherever they feel one of their own has been mishandled,” Sonko said yesterday. 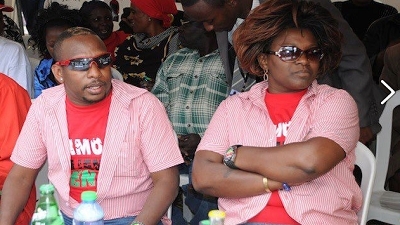 Shebesh and Sonko have been an item of gossip since the former ODM nominated Mp ditched the party and joined Uhuru Kenyatta’s wing. Towards the election day, it took the intervention of then candidate Uhuru to publicly wipe the two after they had dejectedly snubbed then TNA candidate Ferdinand Waititu to join, though for only a few hours, the Jimnah Mbaru camp. Then allegations emerged of a sexual nature between the two and which the Senator dismissed. â€œI love Rachel so much as a good friend, but people just exaggerate things. I havenâ€™t slept with her. I donâ€™t know why people want to spoil Rachelâ€™s good name. There is no romantic link between us,â€ Sonko was quoted saying. The incident has now put spotlight on Shebesh and whether her actions are so vile as to be tolerated Â by real African men; however pious they may be.